There is a lot more to grand juries than what is written below, but here is a quick summary of the main points you need to know. 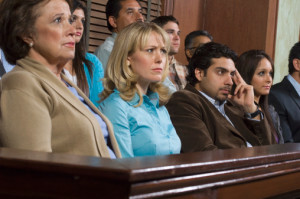 The grand jury, which is generally composed of 16 to 23 citizens (referred to as “grand jurors”), plays a key role in the criminal justice process. Grand jurors can serve anywhere from a month to a year, and a variety of criminal cases are presented to them for their review. In this respect, the grand jury is different from a trial jury, which is composed of six to 12 people and convenes only for the pendency of the trial the citizen is selected to serve on. Also, contrary to widespread belief, the grand jury does not make the decision regarding whether the accused goes to jail. Instead, the grand jury helps the prosecutor, the person who initiates legal proceedings against the accused, decide whether to indict the accused. To bring an indictment against a person means to bring formal charges against him for a crime he has allegedly committed. During this stage, the grand jurors review evidence presented to them and/or hear sworn testimony from one or more witnesses regarding potential charges an accused faces. The grand jurors only need to decide if it is probable–more than mere suspicion, but less than certainty–that a crime(s) was committed, based on the evidence presented to them. If the grand jury believes there is enough evidence against an accused, it will return a “true bill.” A true bill is simply the grand jury’s approval of the prosecutor’s proposed indictment against an accused. If the grand jurors do not believe that there is sufficient evidence to render an indictment, they may return a “no bill.” Said simply, the grand jury is the first step in the criminal trial process, and they have the power to trigger, or halt, the criminal trial process.